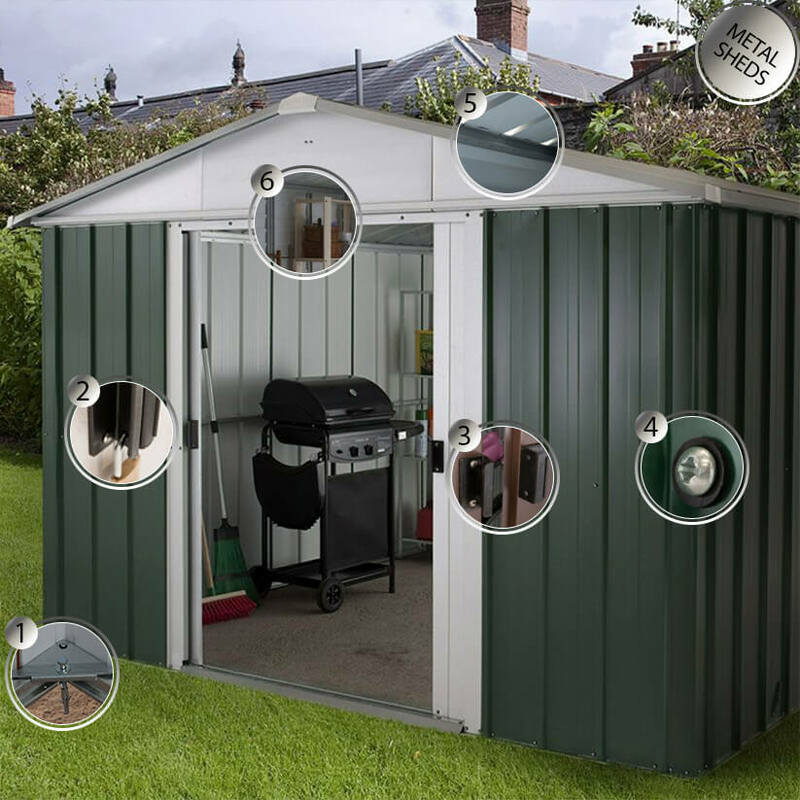 Cleverley designed, built to last and with a fantastic 15-year anti-rust guarantee, this 10x17 metal garage is the ideal place to leave a car and makes an unbeatable garden storage facility. Cleverley designed, built to last and with a fantastic 15-year anti-rust guarantee, the 10’ x 17’ Yardmaster 1017 Metal Garage is the ideal place to leave a car and makes an unbeatable garden storage facility. Completely constructed from zinc-plated steel, with a clear resin bonding, stone-grey finish and smart apex roof, this premium carport is not only as tough as they come, but is incredibly handsome too. Weather-resistant, blister, crack and insect-proof, with no worries about painting, treatment or wind-torn roof felt, this maintenance-free garage building offers outstanding garden storage with zero hassle. Furthermore, the unique 7 layers of protection ensure that corrosion will never be an issue and that it will remain looking pristine for many years to come. Easy access to this garage is gained through double doors, which come with a padlock fixing (padlock not included), so both car and stored items will be completely protected from the elements and unwanted attention alike. The translucent roof panels provide plenty of natural light, which is invaluable when carrying out practical tasks, whilst up to 2.2m headroom and ventilation along the ridge and eaves provide plenty of room for manoeuvre and ideal storage conditions respectively. Measuring 2970mm x 5220mm x 2210mm, this 10x17 prefab garage comes with rust-proof screws, anchor fixings, clearly-numbered parts, an assembly manual and UK-based telephone support to ensure a straightforward, secure assembly.